What Happened to Jesus During The Forty Days? 136:4.1 Day by day, up in the hills, Jesus formulated the plans for the remainder of his Urantia bestowal. He first decided not to teach contemporaneously with John. He planned to remain in comparative retirement until the work of John achieved its purpose, or until John was suddenly stopped by imprisonment. Jesus well knew that John's fearless and tactless preaching would presently arouse the fears and enmity of the civil rulers. In view of John's precarious situation, Jesus began definitely to plan his program of public labors in behalf of his people and the world, in behalf of every inhabited world throughout his vast universe. Michael's mortal bestowal was on Urantia but for all worlds of Nebadon. 136:4.2 The first thing Jesus did, after thinking through the general plan of co-ordinating his program with John's movement, was to review in his mind the instructions of Immanuel. Carefully he thought over the advice given him concerning his methods of labor, and that he was to leave no permanent writing on the planet. Never again did Jesus write on anything except sand. On his next visit to Nazareth, much to the sorrow of his brother Joseph, Jesus destroyed all of his writing that was preserved on the boards about the carpenter shop, and which hung upon the walls of the old home. And Jesus pondered well over Immanuel's advice pertaining to his economic, social, and political attitude toward the world as he should find it. 136:4.3 Jesus did not fast during this forty days' isolation. The longest period he went without food was his first two days in the hills when he was so engrossed with his thinking that he forgot all about eating. But on the third day he went in search of food. Neither was he tempted during this time by any evil spirits or rebel personalities of station on this world or from any other world. 136:4.4 These forty days were the occasion of the final conference between the human and the divine minds, or rather the first real functioning of these two minds as now made one. The results of this momentous season of meditation demonstrated conclusively that the divine mind has triumphantly and spiritually dominated the human intellect. The mind of man has become the mind of God from this time on, and though the selfhood of the mind of man is ever present, always does this spiritualized human mind say, "Not my will but yours be done." 136:4.5 The transactions of this eventful time were not the fantastic visions of a starved and weakened mind, neither were they the confused and puerile symbolisms which afterward gained record as the "temptations of Jesus in the wilderness." Rather was this a season for thinking over the whole eventful and varied career of the Urantia bestowal and for the careful laying of those plans for further ministry which would best serve this world while also contributing something to the betterment of all other rebellion-isolated spheres. Jesus thought over the whole span of human life on Urantia, from the days of Andon and Fonta, down through Adam's default, and on to the ministry of the Melchizedek of Salem. 2. The Father's way—the exemplification of a farseeing ideal of creature life visualized by the high personalities of the Paradise administration of the universe of universes. 136:4.7 It was thus made clear to Jesus that there were two ways in which he could order the remainder of his earth life. Each of these ways had something to be said in its favor as it might be regarded in the light of the immediate situation. The Son of Man clearly saw that his choice between these two modes of conduct would have nothing to do with his reception of universe sovereignty; that was a matter already settled and sealed on the records of the universe of universes and only awaited his demand in person. But it was indicated to Jesus that it would afford his Paradise brother, Immanuel, great satisfaction if he, Jesus, should see fit to finish up his earth career of incarnation as he had so nobly begun it, always subject to the Father's will. On the third day of this isolation Jesus promised himself he would go back to the world to finish his earth career, and that in a situation involving any two ways he would always choose the Father's will. And he lived out the remainder of his earth life always true to that resolve. Even to the bitter end he invariably subordinated his sovereign will to that of his heavenly Father. 136:4.8 The forty days in the mountain wilderness were not a period of great temptation but rather the period of the Master's great decisions. 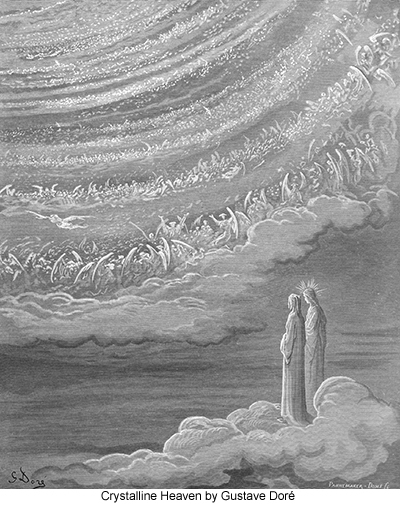 During these days of lone communion with himself and his Father's immediate presence—the Personalized Adjuster (he no longer had a personal seraphic guardian)—he arrived, one by one, at the great decisions which were to control his policies and conduct for the remainder of his earth career. 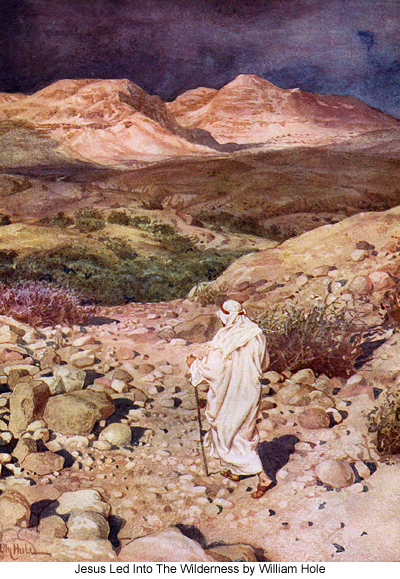 Subsequently the tradition of a great temptation became attached to this period of isolation through confusion with the fragmentary narratives of the Mount Hermon struggles, and further because it was the custom to have all great prophets and human leaders begin their public careers by undergoing these supposed seasons of fasting and prayer. It had always been Jesus' practice, when facing any new or serious decisions, to withdraw for communion with his own spirit that he might seek to know the will of God. 136:4.10 1. He entertained a strong desire to win his people—and the whole world—to believe in him and to accept his new spiritual kingdom. And he well knew their ideas concerning the coming Messiah. 136:4.11 2. To live and work as he knew his Father would approve, to conduct his work in behalf of other worlds in need, and to continue, in the establishment of the kingdom, to reveal the Father and show forth his divine character of love. 136:4.12 Throughout these eventful days Jesus lived in an ancient rock cavern, a shelter in the side of the hills near a village sometime called Beit Adis. He drank from the small spring which came from the side of the hill near this rock shelter. 136:5.1 On the third day after beginning this conference with himself and his Personalized Adjuster, Jesus was presented with the vision of the assembled celestial hosts of Nebadon sent by their commanders to wait upon the will of their beloved Sovereign. This mighty host embraced twelve legions of seraphim and proportionate numbers of every order of universe intelligence. And the first great decision of Jesus' isolation had to do with whether or not he would make use of these mighty personalities in connection with the ensuing program of his public work on Urantia. 136:5.2 Jesus decided that he would not utilize a single personality of this vast assemblage unless it should become evident that this was his Father's will. Notwithstanding this general decision, this vast host remained with him throughout the balance of his earth life, always in readiness to obey the least _expression of their Sovereign's will. Although Jesus did not constantly behold these attendant personalities with his human eyes, his associated Personalized Adjuster did constantly behold, and could communicate with, all of them. Thus by one great decision Jesus voluntarily deprived himself of all superhuman co-operation in all matters having to do with the remainder of his mortal career unless the Father might independently choose to participate in some certain act or episode of the Son's earth labors. 136:6.1 Having settled his policy concerning all personalities of all classes of his created intelligences, so far as this could be determined in view of the inherent potential of his new status of divinity, Jesus now turned his thoughts toward himself. What would he, now the fully self- conscious creator of all things and beings existent in this universe, do with these creator prerogatives in the recurring life situations which would immediately confront him when he returned to Galilee to resume his work among men? In fact, already, and right where he was in these lonely hills, had this problem forcibly presented itself in the matter of obtaining food. By the third day of his solitary meditations the human body grew hungry. Should he go in quest of food as any ordinary man would, or should he merely exercise his normal creative powers and produce suitable bodily nourishment ready at hand? And this great decision of the Master has been portrayed to you as a temptation—as a challenge by supposed enemies that he "command that these stones become loaves of bread." 136:6.2 Jesus thus settled upon another and consistent policy for the remainder of his earth labors. As far as his personal necessities were concerned, and in general even in his relations with other personalities, he now deliberately chose to pursue the path of normal earthly existence; he definitely decided against a policy which would transcend, violate, or outrage his own established natural laws. But he could not promise himself, as he had already been warned by his Personalized Adjuster, that these natural laws might not, in certain conceivable circumstances, be greatly accelerated. In principle, Jesus decided that his lifework should be organized and prosecuted in accordance with natural law and in harmony with the existing social organization. The Master thereby chose a program of living which was the equivalent of deciding against miracles and wonders. Again he decided in favor of "the Father's will"; again he surrendered everything into the hands of his Paradise Father. 136:6.3 Jesus' human nature dictated that the first duty was self-preservation; that is the normal attitude of the natural man on the worlds of time and space, and it is, therefore, a legitimate reaction of a Urantia mortal. But Jesus was not concerned merely with this world and its creatures; he was living a life designed to instruct and inspire the manifold creatures of a far-flung universe. 136:6.4 Before his baptismal illumination he had lived in perfect submission to the will and guidance of his heavenly Father. He emphatically decided to continue on in just such implicit mortal dependence on the Father's will. He purposed to follow the unnatural course—he decided not to seek self- preservation. He chose to go on pursuing the policy of refusing to defend himself. He formulated his conclusions in the words of Scripture familiar to his human mind: "Man shall not live by bread alone but by every word that proceeds from the mouth of God." In reaching this conclusion in regard to the appetite of the physical nature as expressed in hunger for food, the Son of Man made his final declaration concerning all other urges of the flesh and the natural impulses of human nature. 136:6.5 His superhuman power he might possibly use for others, but for himself, never. And he pursued this policy consistently to the very end, when it was jeeringly said of him: "He saved others; himself he cannot save"—because he would not. 136:6.6 The Jews were expecting a Messiah who would do even greater wonders than Moses, who was reputed to have brought forth water from the rock in a desert place and to have fed their forefathers with manna in the wilderness. Jesus knew the sort of Messiah his compatriots expected, and he had all the powers and prerogatives to measure up to their most sanguine expectations, but he decided against such a magnificent program of power and glory. Jesus looked upon such a course of expected miracle working as a harking back to the olden days of ignorant magic and the degraded practices of the savage medicine men. Possibly, for the salvation of his creatures, he might accelerate natural law, but to transcend his own laws, either for the benefit of himself or the over awing of his fellow men, that he would not do. And the Master's decision was final. 136:6.7 Jesus sorrowed for his people; he fully understood how they had been led up to the expectation of the coming Messiah, the time when "the earth will yield its fruits ten thousandfold, and on one vine there will be a thousand branches, and each branch will produce a thousand clusters, and each cluster will produce a thousand grapes, and each grape will produce a gallon of wine." The Jews believed the Messiah would usher in an era of miraculous plenty. 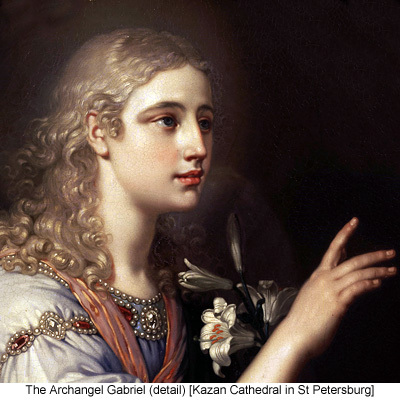 The Hebrews had long been nurtured on traditions of miracles and legends of wonders. 136:6.10 This great decision of Jesus portrays dramatically the truth that selfish satisfaction and sensuous gratification, alone and of themselves, are not able to confer happiness upon evolving human beings. There are higher values in mortal existence—intellectual mastery and spiritual achievement—which far transcend the necessary gratification of man's purely physical appetites and urges. Man's natural endowment of talent and ability should be chiefly devoted to the development and ennoblement of his higher powers of mind and spirit. 136:7.2 Jesus knew his fellow countrymen were expecting a Messiah who would be above natural law. Well had he been taught that Scripture: "There shall no evil befall you, neither shall any plague come near your dwelling. For he shall give his angels charge over you, to keep you in all your ways. They shall bear you up in their hands lest you dash your foot against a stone." Would this sort of presumption, this defiance of his Father's laws of gravity, be justified in order to protect himself from possible harm or, perchance, to win the confidence of his mistaught and distracted people? But such a course, however gratifying to the sign-seeking Jews, would be, not a revelation of his Father, but a questionable trifling with the established laws of the universe of universes. 136:8.1 The next great problem with which this God-man wrestled and which he presently decided in accordance with the will of the Father in heaven, concerned the question as to whether or not any of his superhuman powers should be employed for the purpose of attracting the attention and winning the adherence of his fellow men. Should he in any manner lend his universe powers to the gratification of the Jewish hankering for the spectacular and the marvelous? He decided that he should not. He settled upon a policy of procedure which eliminated all such practices as the method of bringing his mission to the notice of men. And he consistently lived up to this great decision. Even when he permitted the manifestation of numerous time- shortening ministrations of mercy, he almost invariably admonished the recipients of his healing ministry to tell no man about the benefits they had received. And always did he refuse the taunting challenge of his enemies to "show us a sign" in proof and demonstration of his divinity. 136:8.3 Throughout all this momentous dialogue of Jesus' communing with himself, there was present the human element of questioning and near- doubting, for Jesus was man as well as God. It was evident he would never be received by the Jews as the Messiah if he did not work wonders. Besides, if he would consent to do just one unnatural thing, the human mind would know of a certainty that it was in subservience to a truly divine mind. Would it be consistent with "the Father's will" for the divine mind to make this concession to the doubting nature of the human mind? Jesus decided that it would not and cited the presence of the Personalized Adjuster as sufficient proof of divinity in partnership with humanity. 136:8.4 Jesus had traveled much; he recalled Rome, Alexandria, and Damascus. He knew the methods of the world—how people gained their ends in politics and commerce by compromise and diplomacy. Would he utilize this knowledge in the furtherance of his mission on earth? He likewise decided against all compromise with the wisdom of the world and the influence of riches in the establishment of the kingdom. He again chose to depend exclusively on the Father's will. 136:8.5 Jesus was fully aware of the short cuts open to one of his powers. He knew many ways in which the attention of the nation, and the whole world, could be immediately focused upon himself. Soon the Passover would be celebrated at Jerusalem; the city would be thronged with visitors. He could ascend the pinnacle of the temple and before the bewildered multitude walk out on the air; that would be the kind of a Messiah they were looking for. But he would subsequently disappoint them since he had not come to re-establish David's throne. And he knew the futility of the Caligastia method of trying to get ahead of the natural, slow, and sure way of accomplishing the divine purpose. Again the Son of Man bowed obediently to the Father's way, the Father's will. 136:8.6 Jesus chose to establish the kingdom of heaven in the hearts of mankind by natural, ordinary, difficult, and trying methods, just such procedures as his earth children must subsequently follow in their work of enlarging and extending that heavenly kingdom. For well did the Son of Man know that it would be "through much tribulation that many of the children of all ages would enter into the kingdom." Jesus was now passing through the great test of civilized man, to have power and steadfastly refuse to use it for purely selfish or personal purposes. 136:10.1 On the last day of this memorable isolation, before starting down the mountain to join John and his disciples, the Son of Man made his final decision. And this decision he communicated to the Personalized Adjuster in these words, "And in all other matters, as in these now of decision-record, I pledge you I will be subject to the will of my Father." And when he had thus spoken, he journeyed down the mountain. And his face shone with the glory of spiritual victory and moral achievement.